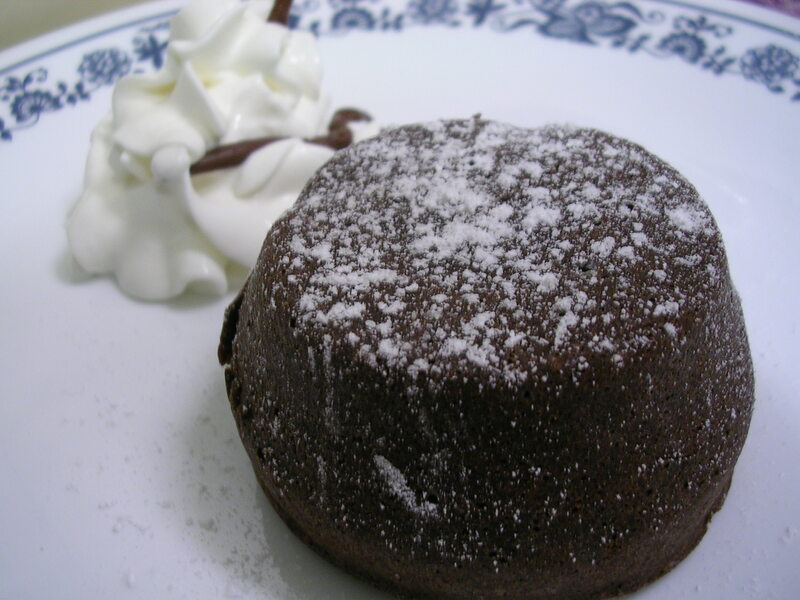 The recipe I share with you is the original recipe from Jean-Georges Vongerichten, a chef who created this dessert by accident when he under-baked a chocolate cake such that it was still liquid in the center. First published in 1999, this is the classic recipe, which I think is the perfect starting point for this dessert. 1. Preheat oven to 450 degrees F. Butter and flour two 6 oz. ramekins. 2. 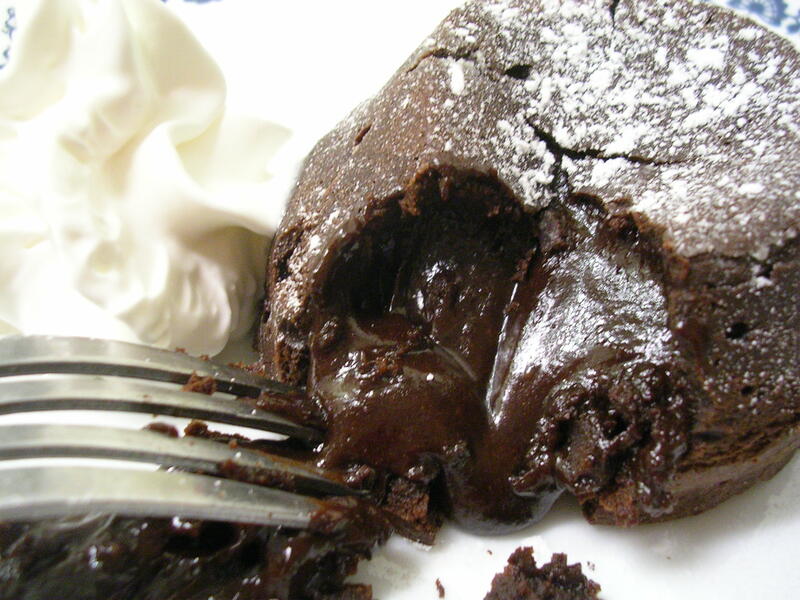 In the microwave, melt chocolate and butter together in a bowl. 4. 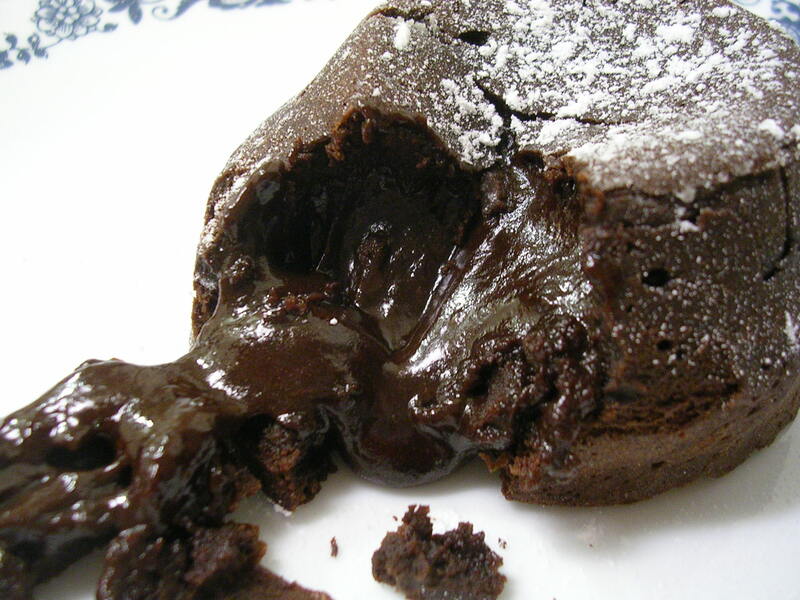 Stir in melted chocolate and flour and mix well. Spoon into prepared ramekins, and set on a flat baking sheet. Bake in the oven for 12 minutes. The sides of the cake will rise and look cake-y, while the center remains liquid and batter-like in appearance. 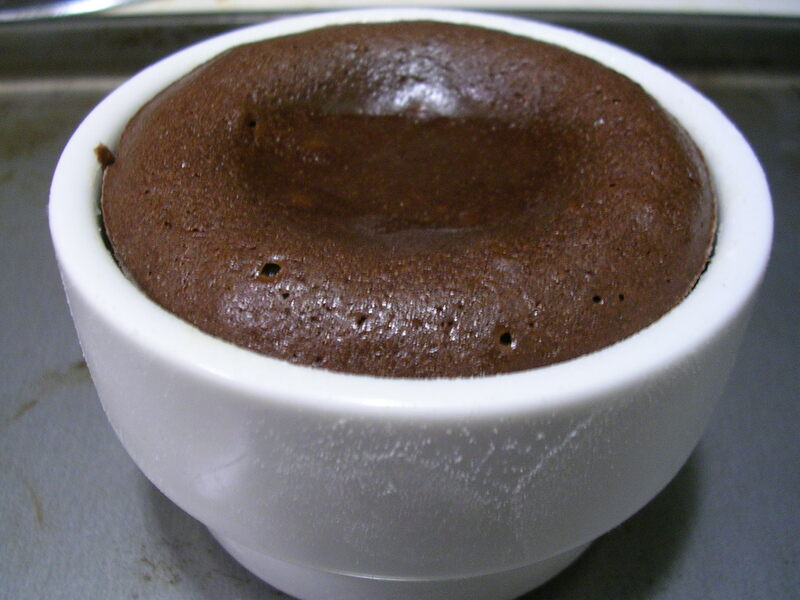 Remove from oven and let sit for 1 minute in ramekins. Note: I had no bittersweet baking chocolate on hand, so I made an improvisational substitution using 2 oz. unsweetened chocolate + 1.5 tbsp sugar + 1/2 oz. semisweet chocolate + 1/2 oz. milk chocolate. You are trying to achieve about a 60% cocoa content to 40% sugar content in the final chocolate. Unsweetened chocolate clearly has no sugar, so I added 1.5 tbsp, which is about 1.5 oz., thus making the chocolate approximately 60% cocoa to 40% sugar (1.5 oz. sugar out of 3.5 oz. total). Then throwing in the semi-sweet (50% cocoa) and milk chocolate (30% cocoa) gave me something probably similar to semi-sweet chocolate in the end, which was a very rich chocolate without too much sweetness. Feel free to experiment with chocolate here to suit your sweetness preference. Having gotten this dessert before at Finale, both me and my boyfriend agreed that this version of the cake was better, as it had a deep rich chocolate flavor that wasn’t too sweet. He thought that the restaurant version tasted like a Hershey’s chocolate cake and the homemade one was more like a high end chocolate cake. It really emphasizes the cocoa, and the molten center was a perfect smooth and creamy consistency… not too liquid that it would be runny, and not too thick like custard. What was especially nice was the outer cake layer, which had a slightly crunchy crust on the outside that made each bite of cake plus molten center a texture and flavor sensation. This entry was posted on Sunday, February 17th, 2008 at 7:48 am	and posted in American, baking, desserts, recipes, Uncategorized. You can follow any responses to this entry through the RSS 2.0 feed. Oh that looks damn fine! Being a (I admit it with pride) a poor cook – I wonder how an 'easy' recipe will turn out!